"The moral vanguard of change." In the fall of 2011, I spent a few days with a group of young people—well, mostly young people—having been commissioned by a magazine to write an article about the Occupy Wall Street protest movement in New York. In the end, I didn't get the article written, primarily because I couldn't find a way to explain the enormous spiritual anxiety I felt radiating from nearly all of the people I met. Nonetheless, in the purity of their spiritual angst, the protestors seemed to me a revelation. Conservative journals and websites at the time made much of the underreported crime, the rapes and robberies, at Occupy sites, even while liberal publications pronounced the movement utterly peaceful. But my own experience was that the protestors were, on the whole, astonishingly good people, if the word good is used in a somewhat special sense. There around Zuccotti Park, down near Wall Street, a few hundred of them had gathered for deeply felt moral purposes they could not name with any precision—for moral goals they often refused, as a moral principle, to specify. Claiming to speak for the "99 percent," the impoverished majority of the world, the Occupy protestors clearly desired wealth redistribution of some kind, and yet they repeatedly rejected any attempt to issue a set of policy demands to achieve that end. "We want change," a sweet young man and his girlfriend tried to explain to me after I'd brought them coffee and Danish early one morning. "Just change." But when I asked him what change in particular, he picked at the raveled cuffs of his hoodie for a while before rambling through a tirade that amounted to little more than a wish that his own moral outrage would shame America's wealthy malefactors into a reformation of the heart. Most of all, he said, "we want people to know about the wrongness in society the way we do. We want them to see us as the 'moral vanguard of change' " (repeating a catchphrase from a meeting the night before). "Exactly," the young woman with him added. "We want people to see how brave we are, and to know that they can be brave, too." We want people to see how brave we are—in that ingenuous phrase, and in its speaker's guileless face, was written all the burden of our anxious age: an anxiety not just to be morally right but to be confirmed as morally right. Not just to be saved but to be certain of salvation. The people at Occupy Wall Street were the return of the Levellers and Diggers, lifted straight out of the 17th century—albeit with the explicit religion of those old Christian movements shed along the way. (Except for a pair of elderly peace activists trying to start a prayer circle, everyone I interviewed described Christianity in general, and Catholicism in particular, as a major source of the evil they had set out to oppose.) "Demands cannot reflect inevitable success," as an Occupy manifesto declared in a wonderful blast of chiliastic rhetoric. "Demands imply condition, and we will never stop. Demands cannot reflect the time scale that we are working with." But if the Occupy protesters (and the media reporting on them) lack the religious-history vocabulary with which to look back and understand their movement, that doesn't mean they think of themselves as divorced from the past. They consistently claim, in fact, a relation to the tradition of political thought known as Anarchism. Not the bombings and assassinations of the late 19th and early 20th centuries, of course; they typically run from association with that violence as fast as they can. But they often, and sometimes convincingly, report that the movement was watered by the stream of philosophical Anarchism that flows from Pierre-Joseph Proudhon and Max Stirner to Mikhail Bakunin and Emma Goldman. Far less convincing is their attempt to claim everyone from Lao Tzu and Diogenes the Cynic to François Rabelais and William Penn as true anarchists, but what movement doesn't cast a wide net when fishing for grand names from the past with which to associate themselves? It's this assertion of reborn Anarchism that has received the most publishing attention in recent years. When I mentioned an interest in the subject, Books & Culture editor John Wilson emptied a shelf of his review-copy bookcase, sending me Paul and Karen Avrich's Sasha and Emma: The Anarchist Odyssey of Alexander Berkman and Emma Goldman and Alex Butterworth's The World That Never Was: A True Story of Dreamers, Schemers, Anarchists, and Secret Agents, together with Marina A. Sitrin's Everyday Revolutions and the anthology Prison Blossoms. He'd clearly been saving up on the topic for a while, since he even added a set of pre-Occupy volumes from the past few years: Peter Marshall's Demanding the Impossible, John Merriman's The Dynamite Club, and Tripp York's Living on Hope While Living in Babylon: The Christian Anarchists of the 20th Century. And that first mountain of books didn't include the three most widely reviewed new volumes on Anarchism in the wake of the Occupy movement, which had to arrive in a second bundle—David Graeber's The Democracy Project: A History, a Crisis, a Movement, James C. Scott's Two Cheers for Anarchism, and the multi-editor anthology We Are Many: Reflections on Movement Strategy from Occupation to Liberation. I couldn't begin to read them all. I swore I wouldn't begin to read them all. But, then, I'm one of those people who lose time in grocery stores compulsively reading the text on cereal boxes, and I was incapable of not at least browsing my way through the forest of words. So let's do a little clearing away of the underbrush. At a quick glance, Sasha and Emma seems solid professional historical work, with a narrative so painstakingly bloated that only specialists in the academic field will finish it. Butterworth's large-canvas The World That Never Was and Merriman's pointillist The Dynamite Club are both interesting popular history. Everyday Revolutions, Sitrin's account of Argentinian anarchism … I don't know what to say. The prose was so peculiar—alternating a thoughtless postmodernist pseudo-technical vocabulary with passages of equally thoughtless sentimentality—that it seems to have glued the pages together, making it impossible to wrench open the book past the second chapter. The anthology Prison Blossoms, gathering old American texts, and We Are Many, collecting more recent reflections, both offer primary documentation. That doesn't make them readable, of course, but at least they have a reason to exist. Which Peter Marshall's Demanding the Impossible doesn't, as far as I can tell: error-ridden bloviation masquerading as an objective history of Anarchism is how it seemed before I gave up on its door-stopper 800 pages. Tripp York's small defense of Christian Anarchism, Living on Hope While Living in Babylon, however—now that was interesting. I recommend it to anyone generally interested in the topic, but written as it was before the clarifications that Occupy Wall Street brought, the book lacks analysis of the central fact to which any would-be Christian anarchist must face up: the deep anti-Christianity that pervades the movement. I'm certain I haven't done these books justice. But what does seem apparent, even in an incomplete browsing of the topic, is that people in the Occupy movement are on a desperate hunt for an ideology. Or, at least (since many anarchists claim to reject the whole idea of ideologies), for some kind of satisfying philosophical account of themselves. And they have thus far produced only two significant texts: David Graeber's The Democracy Project and James C. Scott's Two Cheers for Anarchism. Let's start with The Democracy Project. The ironies of attempting to be an anarchist in the political conditions of the early 21st century are not lost on Graeber. He tells, for instance, the story of participating in a London protest while thinking how odd it is to be among "a bunch of anarchists in masks outside Topshop, lobbing paint bombs over a line of riot cops, shouting, Pay your taxes!" But he believes, nonetheless, that a new theory began to emerge in the actual practice of Anarchism discovered by the Occupy movement. He played a role in the beginnings of that movement, and he spends most of The Democracy Project recounting its origins, explicating its history, and defending its reputation against its critics on the Left. Insofar as Graeber has given us something new in the book, it's not in the critiques he offers of the state, which are mostly the well-worn tropes one can hear from the libertarian right as often as the anarchist left: "Soliciting bribes has been relabeled fundraising and bribery itself lobbying," as Graeber notes. "At this point, bribery has become the very basis of our system of government." Of course, unlike the Tea Partiers on the right, he has no use for the Founding Fathers, whom he dismisses as anti-democrats. In a potted and bizarrely applied bit of pseudo-history, he suggests that what little democracy the 1776 revolution gave us derived from the colonists' admiring notice of the Iroquois and self-governing pirate ships. He has a pair of interesting purposes in mind, however, in referencing societies believed (or blithely asserted, on thin historical evidence) to be non-hierarchical and contrasting them to the American Founding. The first is to suggest that the overwhelming governmental bureaucracy of our time was born from the Founders' statism, making it inevitable that American government would eventually use faceless administrators to keep itself free from accountability by relying on faceless administrators. And the second purpose is to propose that the Anarchism of the Occupy encampments found a truer form of freedom: democracy without the seeds of big government that the Constitution planted. That new, truly democratic Anarchism was made possible, Graeber thinks, not so much by the Occupy movement's claim to represent the impoverished "99 percent" against the unholy nexus of big government and big corporations in the wake of the financial collapses of 2008. True democracy emerged, he insists, precisely from the refusal to say what exactly the Occupy movement wanted. Occupy was refusal—refusal of the whole mess and an effort not to participate in it even by standard forms of organized protest. "It was only when a movement appeared that resolutely refused to take the traditional path that rejected the existing political order as inherently corrupt, that called for the complete reinvention of American democracy, that occupations immediately began to blossom across the country." Indeed, "the movement did not succeed despite the anarchist element. It succeeded because of it." The problem with all this is, of course, that Occupy Wall Street and its clones in other cities did not actually succeed. They sprouted up, they died (or were at last murdered by the police, in some occupiers' accounts), and nothing changed. The dilemma of Anarchism has always been a practical one: Every attempt at actual Anarchism has eventually become either a puppet of the communists, a leftist statism, or actual anarchy—which is to say a mob without staying power or resilience. Still, Graeber retains his enormous optimism. "We are already anarchists," he claims, "every time we come to understandings with one another that would not require physical threats as a means of enforcement." The bombings and shootings of the original anarchists—in what they called "the propaganda of the deed"—have proved unnecessary, for the fact of the Occupy movement forever changed its participants. They proved, Graeber insists, that the paradox of anarchical organization is possible to overcome, and their example will last in a way that the anarchistic forebears he claims in the revolutions of 1848 and 1968 did not. Less optimistic is James C. Scott, a Yale anthropologist best known for his work in South-east Asian history—and someone who, the much younger David Graeber declares, stands as "one of the great political thinkers of our time." Unfortunately, in Two Cheers for Anarchism, Scott refuses to give us a straightforward book of political thought. What he writes is a meandering set of what he calls "fragments" instead of continuous text. And the idea, I think, is that somehow the anti-organization of the text would echo and reinforce for us the anti-organization of anarchical society. 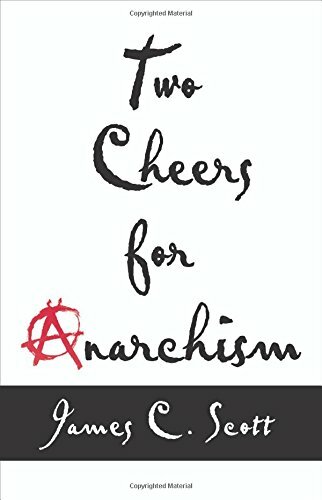 Scott usually calls himself a Marxist, but the recent protests of the anarchists, born in the financial crisis, have created in him a new appreciation for Anarchism—or, at least, enough for him to give the movement the same two out of three cheers Irving Kristol gave in Two Cheers for Capitalism and E. M. Forster in Two Cheers for Democracy. It would be nice if the refusal to give the third cheer were from a recognition of at least a temporary need for some genuine hierarchical government (before, as the Marxists say, the state withers away), and Scott does accept that need, to some degree. The real reason he can't fully support the political philosophy, however, is that Anarchism is insufficiently prepared for revolution. It is disorganized, as one might expect from people who want anarchy. And for the overthrowing of the state, the eradication of the current institutionalized oppressions, that makes it inadequate. And yet, for everything short of that final goal—for preparing the way and having fun while doing it—he praises the kind of non-hierarchical Anarchism that Occupy Wall Street possessed. Scott hates the state: the economic inequalities it licenses, the efforts it makes to force all to think alike, the bureaucratic methods it uses for undemocratic, unelected control. And he thinks we ought all to resist it, even short of organized revolution. "The enthusiasm, spontaneity, and creativity" of a "cascading social movement," he notes, can run "far ahead of the organizations wishing to represent, coordinate, and channel it." And, in an interesting and probably accurate reinterpretation of received history, he dismisses the mainstream organizations that emerged out of the civil-rights struggle in the 1960s as merely the groups with the best public-relations teams—the ones that successfully sold themselves as leaders to a media desperate for an intelligible, hierarchical account with which to understand what was going on. The real civil rights movement, Scott argues, was much wilder, much woollier, and much wackier. Much more like what anarchists want. This is his solution to the leftist historical puzzle that, as he notes, "every major successful revolution ended by creating a state more powerful than the one it overthrew." Indeed, even the Occupy movement's revolutionary rejection of hierarchical revolution brings risks: "Massive disruption and defiance can, under some conditions, lead directly to authoritarianism or fascism rather than reform." But that's because we aren't yet ready for real democratic reform. We need to get our minds straight, he thinks; we need to experience the petty anarchies of this new small Anarchism of refusal. We need to attempt a little more—no, a lot more—"foot-dragging, poaching, pilfering, dissimulation, sabotage, desertion, absenteeism, squatting, and flight" in our everyday lives under this oppressive regime. In Scott's view, what recent movements such as Occupy Wall Street have taught us is that, before the revolution, even Anarchism requires some genuine anarchy. So what are we to think of all this? In the end, the Occupy movement was a disease desperate for a diagnosis, and Anarchism was a diagnosis hungry for a disease. Determined by many factors—over-determined, in fact—their joining was probably inevitable. That doesn't mean, however, that they actually do go together, fitting like hand and glove. They fit more like a pair of boulders that have smashed into each other, and the resulting fissures show even in Graeber and Scott's work. Neither author can fully decide what he thinks about at least a minimal purpose for the hierarchical state, neither author is fully honest about the violence that always threatens to break out in human affairs but especially in anarchical situations, and neither is willing to face up to how self-important and even a little pathetic it is, finally, to promote to grand themes of universal political theory the recent protest movements that, after all, achieved nothing. Perhaps it's worth noticing that the most interesting proposals for Christian Anarchism, from Simone Weil to Wendell Berry, are usually rural, usually agrarian—while the canonical writings of Anarchism, from Pierre-Joseph Proudhon to Emma Goldman, are essentially urban. The Occupy movement occurred entirely in cities, of course, and so it seems natural that its theorists have turned to those urban texts. And yet the protestors who gathered in the actual Occupy encampments, like the young couple I met in New York, often stepped away from the classic forms of Anarchism by excising clear moral purposes from their protests. They typically took it as a point of pride, as a moral principle, that they would not specify exactly what they wanted—for "Demands imply condition, and we will never stop. Demands cannot reflect the time scale that we are working with." In doing so, they found themselves recapitulating not the history of anarchistic revolution but an old religious history of apocalyptic movements, aghast at the failure of God to bring an end to the mess, the evil, they thought they could perceive so clearly. They didn't know this is what they were doing, of course, and given their extreme anti-Christianity, they would resist the explanation with all their strength. But if they genuinely want to build up an explanatory political theory for their experience in their short-lived camps, they might read a little in the Christian anarchists. Or in St. Augustine, for that matter—a man who knew a little about the cost of anarchy, as the Vandals closed around the city of Hippo and the great Roman political order began to collapse. Joseph Bottum is the author of An Anxious Age: The Post-Protestant Ethic and the Spirit of America, forthcoming this winter from Image/Random House. 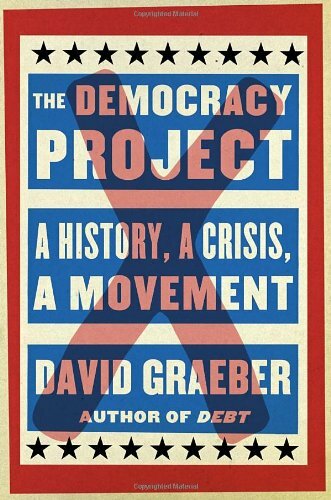 David Graeber, The Democracy Project: A History, a Crisis, a Movement (Spiegel & Grau, 2013). James C. Scott, Two Cheers for Anarchism: Six Easy Pieces on Autonomy, Dignity, and Meaningful Work and Play (Princeton Univ. Press, 2012). Kate Khatib, Margaret Killjoy, Mike McGuire, eds., We Are Many: Reflections on Movement Strategy from Occupation to Liberation (AK Press, 2012). Marina A. Sitrin, Everyday Revolutions: Horizontalism and Autonomy in Argentina (Zed Books, 2012). Alex Butterworth, The World That Never Was: A True Story of Dreamers, Schemers, Anarchists, and Secret Agents (Vintage, 2010). Paul and Karen Avrich, Sasha and Emma: The Anarchist Odyssey of Alexander Berkman and Emma Goldman (Harvard Univ. Press/Belknap Press, 2012). Miriam Brody and Bonnie Buettner, eds., Prison Blossoms: Anarchist Voices from the American Past (Harvard Univ. Press/Belknap Press, 2011). Peter Marshall, Demanding the Impossible: A History of Anarchism (PM Press, 2010). John Merriman, The Dynamite Club: How a Bombing in Fin-de-Siecle Paris Ignited the Age of Modern Terror (Houghton Mifflin Harcourt,2009). Tripp York, Living on Hope While Living in Babylon: The Christian Anarchists of the 20th Century (Wipf & Stock, 2009). Copyright © 2013 by the author or Christianity Today/Books & Culture magazine.